As promised here is the post about Laurence Kavanagh whose work I viewed the other night at Gallery North. I wasn’t sure what to make of it initially. My first observation was the lack of colour. The show was entirely monochrome with the exception of one piece. As a result it was evident that Kavanagh had truly pushed his monochrome palette to it’s limits, using tonal shades of grey I didn’t even know existed! It made me think of the work of John Virtue (see below). Virtue’s work is purely black and white as well. In first year I came across him and at the time I was painting colourful landscapes using oil and white spirit. So my work was incredibly liquid based – I was even dabbling in egg tempura. Upon discovering Virtue’s work I decided to remove all colour from mine; something I had never done before. And something I will never do again! It really did feel limiting. Yet at the same time it was incredibly refreshing as it forced me to use far more imagination, particularly in the textural sense. I used pins to poke holes in my paper, impasto paste mixed into my paint, allowed my liquids to become far more volatile and fluid. 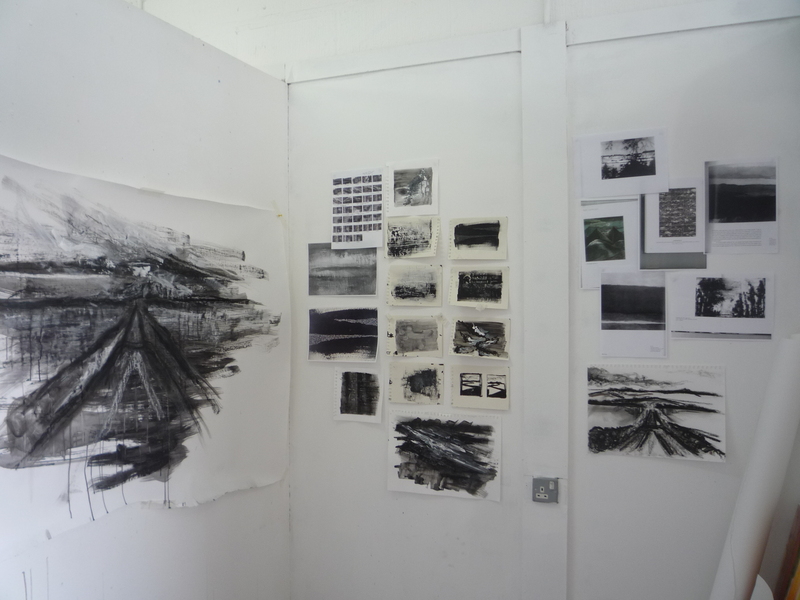 It was however quite a struggle, especially when you look at how stark and colourless my studio became (see below). So I am actually in relative awe that Kavanagh managed to create an entire exhibition in this colour palette without exploding! He too however turns to texture as a substitute for colour. 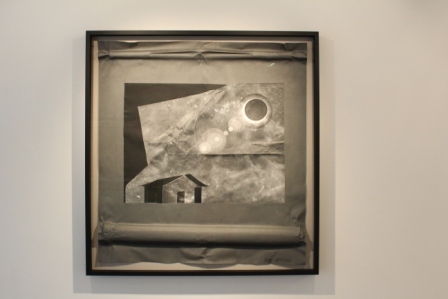 The way in which he folds his paper is incredibly efffective, not only does it appeal to our tactile senses, but it also creates dramatic shadows given the gallery lighting. I think this image above has to be my favourite piece. The little house is just adorable! The paper folds and creases give it an almost child-like quality which I find very appealing. The frame offsets the piece perfectly. People always debate over the importance of framing saying an artwork should be able to stand whether it’s in a good frame or not. I disagree. I think a frame can make or break an artwork. If my work is framed incorrectly it just pisses me off and I feel like the entire work is lost. Slightly over dramatic I know, but when you envision how an artwork should look and it goes wrong, it’s just irritating. 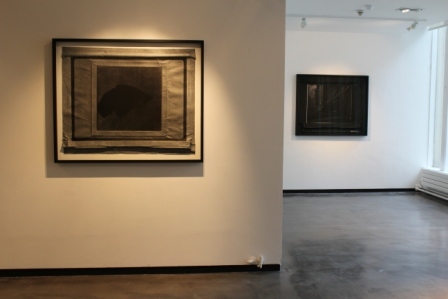 However, Kavanagh doesn’t need to worry because his simple and elegant black frames compliment his work perfectly. The exhibition was aesthetically pleasing in terms of its layout as well. I loved when I walked in and was greeted by an almost cinema screen-like sculpture (top photo). This piece is probably most suggestive of the concepts behind his work. He is exploring the correlation between how we view touch in both the physical and visual sense. 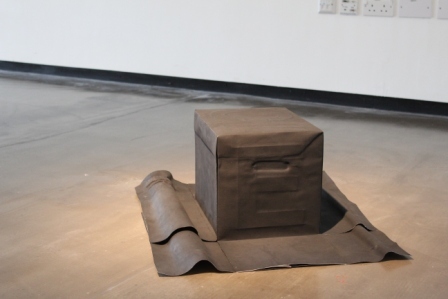 Taking the two-dimensional and the three-dimensional and using them as a means to explore the relationship between subject and photographic imagery. I like how there is all of this allusion and suggestion of cinema, yet there is a total absence of moving image work. 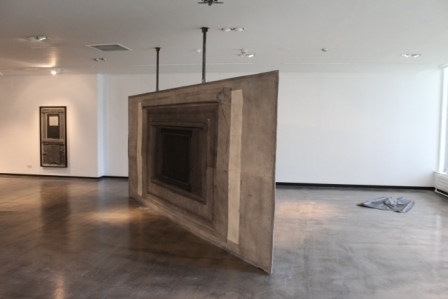 Instead, you have sculptures reminiscent of cinema projectors occupying floor space. Long shadows, spotlights and rectangular shapes all suggest but nothing confirms the cinematic presence. There is an air of expectation in the room, yet the pieces simply hang still and mysteriously giving nothing away. Laurence Kavanagh is a Warwich Stafford Fellow and produced ‘October’ through his research into Star and Shadow Cinema.